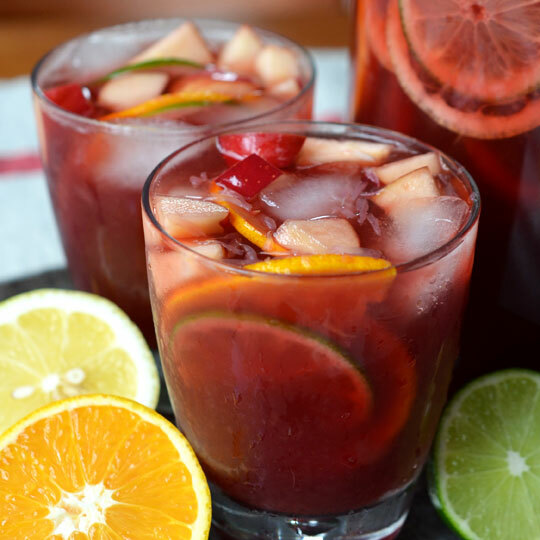 There are thousands of recipes for sangria, each using a different combination of wine and fruit, so I don't worry too much about whether this one is "authentic." For the fruit, I like to use the ample supply of citrus in my local markets and gardens – thin slices of oranges, lemons, limes – plus an apple for crunch. You could also try fresh fruits like strawberries, pineapple or grapes. When steeped for several hours, the fruits both flavor the drink and soak up the liquid, turning plump and juicy. They not only look pretty in the glass, but are a delight to eat. The liquid is a combination of black tea and pomegranate juice, which approximate the sweetness, acidity, and tannins of red wine. It's a beautiful substitute both flavor and color-wise, although caffeine does of course have a more stimulating effect than wine. I also include a little fresh orange juice for sweetness and cinnamon sticks for subtle spice. Just before serving, the drink is lightly carbonated, and the result is a punch suitable for young and old, drinkers and non-drinkers, mealtimes and parties.